Mountain Trek is one of the most awarded fitness retreat and health spas in Canada: for 17 years, their boot camp-style programmes have been bringing those seeking healthy lifestyle transformations together in stunning British Colombia for a week of workouts and relaxation. Promoting vitality, and weight loss, the retreats energise and destress guests. The retreat is six packed days of activity designed to awe and inspire you while you work up a sweat. The schedule will help guests reclaim their functional fitness and natural health, through implementing scientific patterns that raise one's metabolism by balancing key hormones. Guests can expect to see their fitness improve through strength training classes, three hours of daily Nordic fitness trekking, and a variety of evening fitness classes. The retreats clean-eating cuisine removes inflammatory foods such as sugar, alcohol, starch and processed food, and lowers stress and improves sleep by removing caffeine, limiting device use and turning off wifi between 10pm-6am. Each retreat is limited to a maximum of 16 guests per week, including 2 couples, so it's an intimate group to give a chance to meet like-minded individuals and form lasting friendships. Retreats run Saturday to Saturday. Mountain Trek’s classically beautiful timber frame lodge is the perfect accommodation for rediscovering your wellness. Each cosy bedroom has an ensuite bathroom, luxury linens, bathrobe and organic, natural bath products to enjoy. Some rooms offer private patios with lake views, and daily housekeeping and laundry service is available to all. The bed sizes vary but each room is finely appointed although spartan because they’re intended to be slept in – the rest of the time you’ll be Nordic Fitness Trekking outdoors, working out in the fitness rooms, eating delicious spa cuisine meals or relaxing in the outdoor hot tub, in the sauna or steam room or in the massage rooms. The lodge boasts many common areas, including a vast yoga room and gymnasium that look out over the lake and the mountains. The custom-made table in the large dining room seats 16 and the living room has a wood-burning stove and library to encourage evening relaxation. The comprehensive spa area includes an outdoor hot tub, cold plunge pool and waterfall, while indoors there is a steam room, infrared sauna and massage room. Each retreat programme includes all meals. Mountain Trek is not a diet retreat, but aims to promote healthier eating habits and natural detoxification through a clean, unprocessed menu. By encouraging an anabolic (active) metabolism, the cuisine lays the groundwork for positive changes in your life, including detoxification, better sleep and alleviating stress. The food uses locally farmed organic vegetables, fruit, and meat for a calorie-controlled spa menu expertly prepared by professional chefs. You will wake up to a protein shake, enjoy a savoury breakfast, eat snacks and a nutritious lunch on the trail, then relax at dinner over a satisfying, mouth-watering entrée. The cuisine is designed to provide you with all the energy you need for hiking and fitness activities while meeting your health and weight loss goals. Dietary requirements can be catered to - just ask. For programmes in British Columbia, a US$1000 non-refundable deposit (per guest/week) is required at the time of booking, and the balance is payable the day of arrival at Mountain Trek. This deposit is transferable to another week in BC within the same calendar year only. Located in the village of Ainsworth Hot Springs, a beautiful 45-minute drive up the lake from world-famous Nelson, British Columbia, Mountain Trek's beautiful lodge is easily accessible and yet when you arrive you can't help but feel like you're in the middle of paradise. 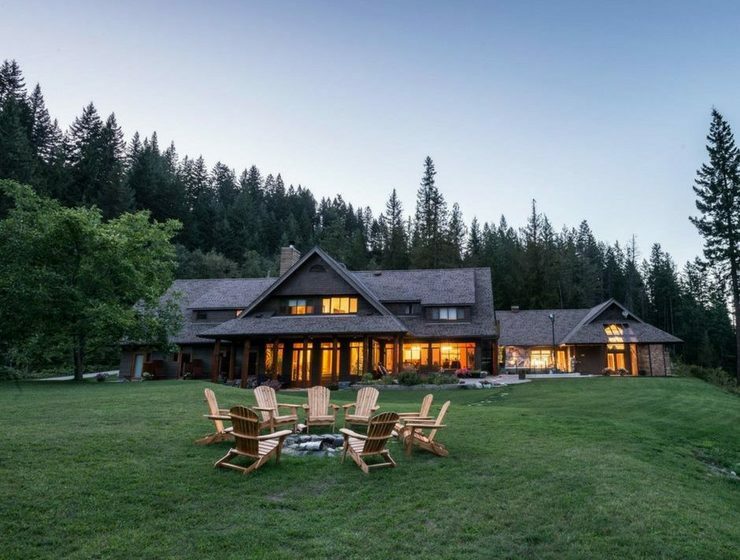 Surrounded by conifer trees, with a sprawling lawn, landscaped outdoor spa area and outdoor fire circle, the lodge offers views of the Selkirk Mountain Range (a sub-range of the Rocky Mountains) as well as the expansive Kootenay Lake, one of the largest in the province.